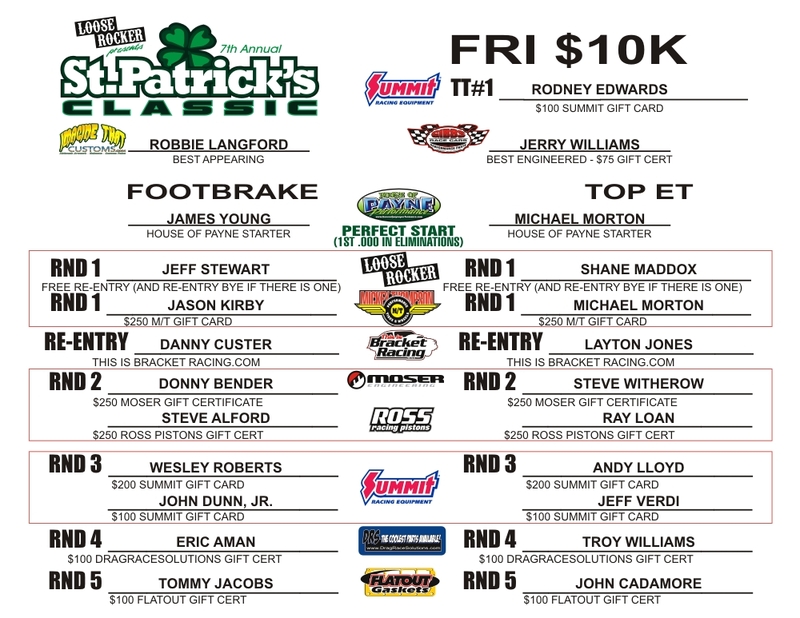 With a huge outpouring of support from our great existing Loose Rocker customers plus many new faces joining us, particularly strong out of Pennsylvania and Ohio, the 7th Annual St. Patrick’s Classic reached an astounding 489 entries… on a FRIDAY, a day that historically draws 325-350 entries! Racers and staff did a great job pushing through as much as we could, but with the huge jump of almost 100 more cars than last year, curfew forced the end of the night. Out of 489 entries that started the day, we were down to 25 in Top and 19 in Footbrake. Loose Rocker added nearly $3,300 to the purse to round up the split to $1,000 per car in Top and $1,100/ea in Footbrake. On Saturday, despite an ominous forecast that led few people to have any hope that we could complete even one or two rounds, the racers and staff continued to operate in hustle mode all day long, and we were able to get to the semifinals before the rain finally snuck in. 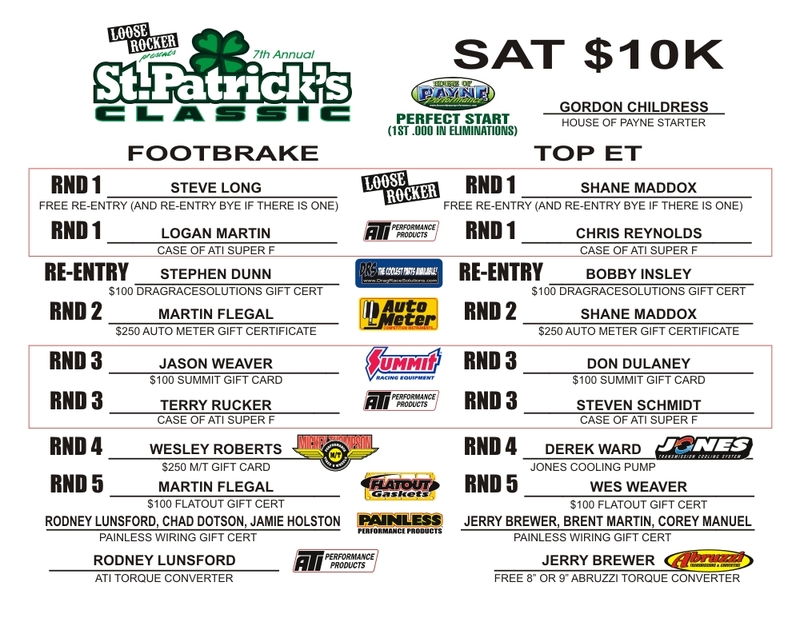 In Top, 2014 St. Patrick’s Classic champion Jerry Brewer was sitting on the bye for the third time, as everytime he earned it, the cars came out even. He was joined by Brent Martin and 2015 Colonial Classic co-champ Corey Manuel. In Footbrake, Rodney Lunsford put on a master class, still doubled in the semis, and was paired with himself by the ladder, guaranteeing him a spot in the finals. Chad Dotson overcame Jamie Holston in the semis. Loose Rocker would like to extend our most sincere thanks to each and every racer and crew member, sponsor, and fan for an incredible event in the face of Mother Nature-induced adversity. 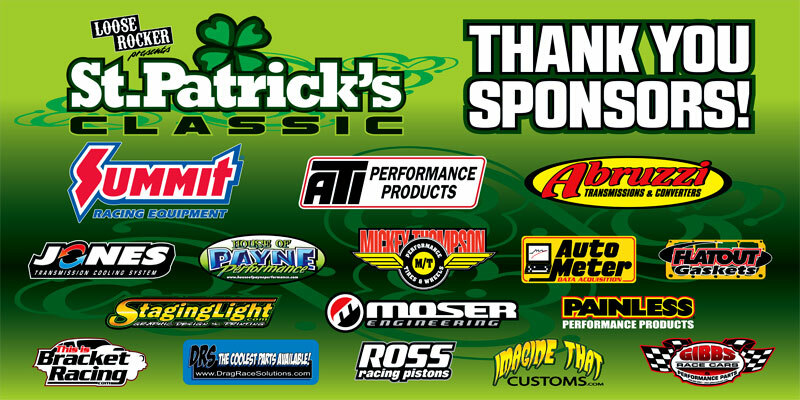 Everyone kept a great attitude and made the St. Patrick’s Classic an enjoyable event.